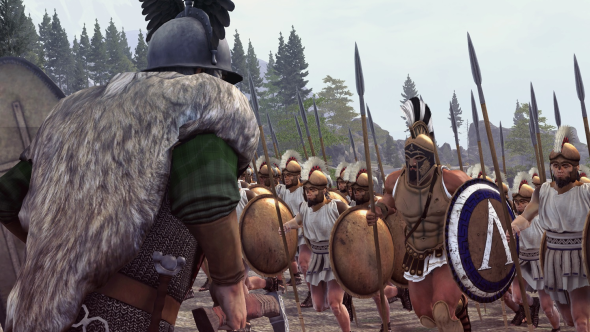 Total War: Arena was announced over five years ago and has had a tumultuous development since, going dark for extended periods and moving briefly into – and then back out of – beta. Many have dismissed it as vaporware at various points, but four months ago it launched into open beta – and has managed to stay there. It is now undoubtedly A Game, at least. Since opening its doors to all and sundry, Creative Assembly has been steadily adding to its 10v10 strategy game, most significantly, dropping in three Carthaginian generals, including Hannibal and his patented elephants. So now seems a good time to check in with the team on how everything has been doing. If you like your games strategic, check out the best strategy games on PC. To catch up on how it’s been going and what’s next, and how the devs have been communicating the complexity of what’s going on on the battlefield to the players, we spoke with lead battle designer Elliott Lock and associate developer communications manager Joshua Williams. PCGN: It’s been almost four months since the start of the open beta. How has it gone? Elliott Lock: It’s been a great period for us. I’d want to start by saying thank you to the team because they’ve been amazing. It’s not easy to develop a live game, it brings with it a lot of new pressures, and requires another level of commitment from our girls and guys to deliver such a strong game. Joshua Williams: Absolutely, and it’s been great to see the community grow during this period. We’re seeing a huge amount of feedback from players. In fact, we were receiving so much feedback that we changed our internal patching process to keep up. The new cadence is much faster and allows us to react to community issues and concerns faster than any Total War title before. Lock: Our hope with this is that the game patches match the pulse of the community a little more. Instead of releasing huge updates at later intervals, which can cloud our data and feedback, the patches are now more regular and can vary in size. How many players has it drawn? What have been the main points of feedback? Williams: Well, we can’t give out exact numbers, but it’s safe to say that we’re pretty happy with the number of new and returning players. The main points of feedback were about progression speed, matchmaking, and commander power limitation. We saw a good number of players say that the game was too grindy, so in response we effectively doubled the speed of progression, which is a change the community are really enjoying. With matchmaking, we committed ourselves to weekly tests and changes to the formula until it was improved, and we are seeing a lot of positivity around these changes. We’ve got some more improvements planned though! Lock: The volume and variance of feedback we receive is vast, and something really interesting we’ve noticed is that the desire from our community with any of these subjects distinctively differs from region to region. So we really need to be careful when we consider our direction so we don’t alienate a group within our community. With the commander power limitation Josh mentioned, we had a big variance in how different regions wanted this to be implemented, and we had to try and find the right implementation that ticks all the boxes. I think we’re all pretty happy that the way it’s done has made matches much fairer. Williams: And in regards to some of those other points, a few months ago we asked the community what kinds of cosmetics they’d like to see. We took the responses to that, and we’ve recently announced more cosmetic options with Commander Skins and Unit Skins. Both features have their roots in that community feedback, and the initial reception to the art for them has been really great. How are you applying these in the next phase of development? Williams: I think here it depends on the issue. If it’s a hot topic, or issue, then we’ll discuss it, read through the community feedback, and try to address it as soon as possible, especially if it affects gameplay. Larger problems with the way mechanics or abilities work take a bit more time, so we factor them in when we’re planning ahead and make sure we know exactly what we would want to change. Lock: Generally speaking, if there’s a common issue or feature being discussed in the community then it’s going to be written on a sticky note and placed at the top of our release board so we can attend to the item as soon as possible. The next phase of development is, for the majority, led and defined by the community. So what are your immediate plans for Total War: Arena’s future? Williams: We’ve got Ambiorix, our new commander, a new faction with unique unit types, a load more balance changes (we’re currently in a cycle of rebalancing all the commander abilities), commander skins, unit skins, new battlefield maps… am I forgetting anything? Lock: Well there’ll be ranked mode, cross-regional play and more commanders too! We actually sort these goals into short-, medium-, and long-term when we talk to the community about them, so they know to expect Ambiorix soon, and know it’ll be a while before Ranked. Williams: And that’s really important to us, making sure the community know where the game is heading, giving them an expectation of when features and content will show up. We release bi-weekly developer newsletters now, and we follow these up with a livestream where we announce all the features in the next patch. 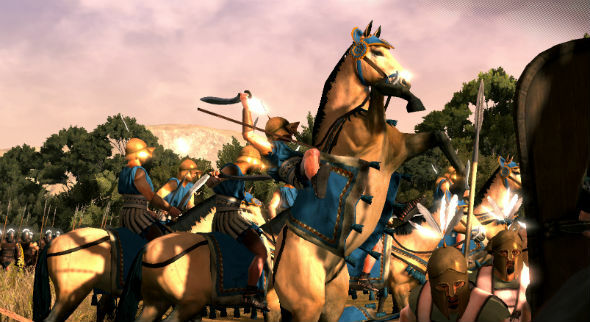 Total War: Arena is more complex than Wargaming’s other games as armies are comprised of many different unit types. Do you think you’ve dealt with those challenges? Lock: Our challenge as with any Total War game is the large amount of depth to understand – a simple example of which is the morale system. Many users’ reactions to this system is “what’s that?” It doesn’t come across as easily as a standard health or even mana mechanic because it’s not a common feature in most games. In addition, we’ve purposely extended the tactical depth of Arena, increasing the height of the skill ceiling compared to past titles. One example is your reference of unit types – each type in Arena plays very differently to the next, and so there’s an education to be had for each. Plus let’s not forget we still need to throw in the complexity of the strategy which comes from the team. Williams: Exactly, with 13 unique unit types, each with different abilities, and 12 different commanders with wildly different skill sets, there’s a lot to take in. And remember, you don’t only have to learn how to play these units, but also how to play against them. To try and make this all as easy to learn as possible, we use the tier system to gradually introduce unit types. We start with five core unit types, and then slowly expand them from there, so new players get to learn their unit’s role at their own pace. Lock: Another challenge for us is considering all these dimensions as parameters for matchmaking. Our generic matchmaking formula has to consider matchmaking time, regional matchmaking, alliance composition, commander tier, commander ability talents, unit tier, unit composition, unit equipment, parties, and player skill, which is no easy job. We’ve spent a lot of time working on the weightings and parameters for these dimensions, and the community feedback on these large-scale tests has been incredibly useful. Williams: But while there are these complexities, the flip side of this is that as these players become more educated about Arena the game shows its true potential. We’ve always been excited by how Arena would play in a purely competitive environment, which is something we’re looking at regarding the endgame. I think players will see a glimpse of this when ranked battles are released, and the reaction will be similar to the levels of excitement experienced during recent tournaments. You’ve said voice chat is on the roadmap – any update? Williams: I don’t think there’s any update specifically about that. I know that recently we were evaluating our communications methods in game, and there are some really cool ideas there. We want to try and break down language barriers, so things like automatic chat translation. 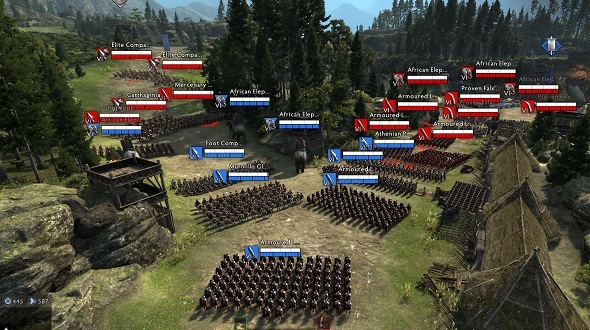 In what ways would you differentiate Arena from Total War multiplayer? Williams: For me, I think it’s easiest to break it down into two key features. Firstly, we have the overarching meta progression, which allows you to build a customised army with a customised commander. You go up through the tiers, new unit types and playstyles etc… it’s a cool progression system that leaves you with a toolkit personalised for your playstyle. Then we have the battles. Here are the main differences I’d say. Firstly, you only have three units each, and that’s because all units and commanders now have abilities, so those three units have the depth of 20 units. You’re now working as part of a team, with nine other people, and using each other’s strengths and weaknesses to try and control, and ultimately win, the battle. It’s a really cool experience to play in a battle where you just click with your teammates and intuitively support each other, and that’s what Arena’s all about. Lock: Absolutely, and this was all designed with purpose and the result is mastery and replayability. When you learn your unit’s skill set, you start to become more involved with the meta-strategy and helping to coordinate the battlefield. On a structural level, Arena is a service with dedicated servers, which help provide features like matchmaking. This ensures a secure environment free of cheating and also provides optimal network performance. Are you at all anxious that these distinctions might be insufficient to stop future Total War releases from chipping away at your community in the long term? Lock: While there is overlap between the products there are no fears of one game making others obsolete, their gameplay experience is too different for this to occur. 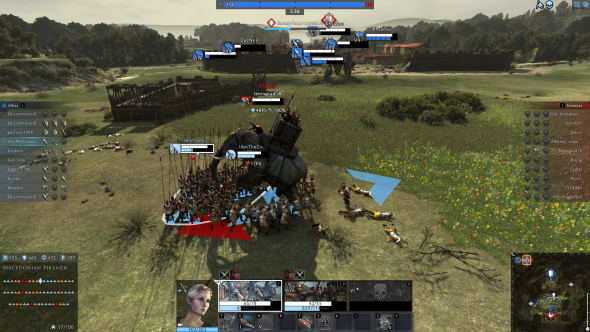 Arena offers a strategic battle experience in ten minutes, it’s a standalone game and is complementary to other Total War games for our core fanbase. Williams: And don’t forget, we’re not going to be sitting on our laurels for the next few years, we’re working on factions, commanders, and loads of other new content. How if at all will future Total War games affect Arena? Are you able to import any technical or UI/UX advancements they may make, for instance? Lock: Arena has and will continue to overlap past, present, and future titles. From its inception we’ve always been sharing tech both ways when viable. A nice example of this is the fog of war – the system has undergone many iterations through the years and it was first seen in Rome 2, but behind closed doors its roots began in Arena. Going the other way, it’s harder to give an example, because most benefits aren’t user-facing. But a recent example that’s been visible involves pipeline improvements to help us execute improved animations. 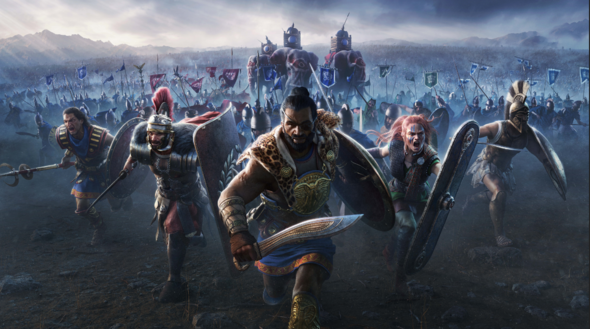 Williams: And as Elliot touched on, sharing ideas and tech the other way too, we’ve seen some Arena battle mechanics are on the wishlists of main-series Total War players. Why do you think many more traditional RTS/RTT competitive games have struggled (excepting MOBAs), and why will Arena avoid their fate? Williams: I think that Arena brings something unique to the table, and while that’s sometimes enough, I think it helps that the core game is just really fun. We’ve seen a lot of games come out and dictate to the gaming community what the game’s direction is going to be, but we didn’t come out onto the scene and tell people ‘we’re going to be an esport’ or ‘we are going to make x content’. We asked the players what they would like to see and what we can support. Now we’re seeing players creating their own tournaments, so we’re implementing more tools to help them with that, we’ve asked players what commanders and factions they’d like to see, what cosmetics we should make, etc. I think that traditional RTS games have a stigma about them, they’re seen as unchanging and dogmatic. We’re trying to change that, to take the best parts of live service games, RTS and MOBAs, and craft them all into one. It’s a triple-A real-time tactics (the blend of RTS and MOBA) free-to-play game with frequent updates based on community feedback, and I think that’s pretty special.